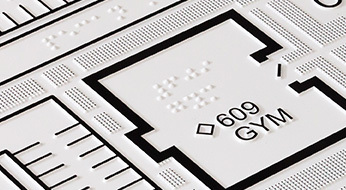 ClickAndGo products combine to provide seamless wayfinding solutions for disabled travelers. Navigational information can be accessed through mobile device, app, virtual kiosk, IVR service, or tactile map. Every solution is customized to help your business comply with state and federal accessibility requirements. ClickAndGo Navigation combines real-time location support and narrative directions in a powerful mobile, web, and IVR solution for independent travelers. Our ClickAndGo navigation app for iPhones and iPads (iOS 7 or greater) is available at the iTunes Store (click here). In-depth information about the app is on this page (click here). 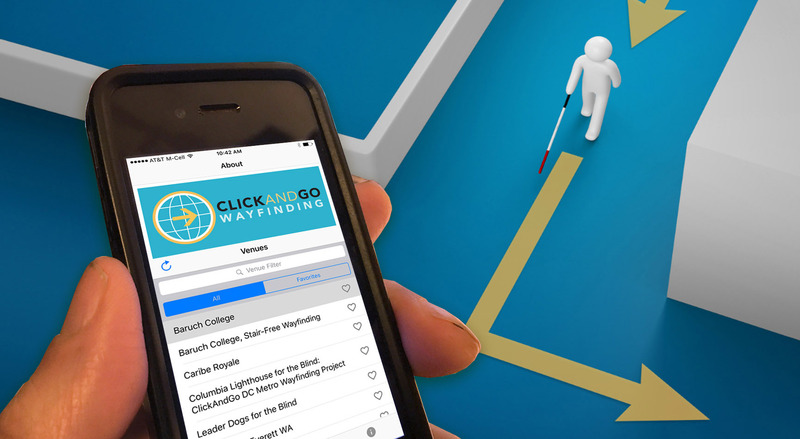 ClickAndGo iBeacons complement our Navigation, Virtual Kiosk, and Tactile Map products by making visual signage and prominent landmarks of all kinds "audibly accessible" to those with blindness or low vision. ClickAndGo tactile maps are an excellent complement to ClickAndGo Navigation. 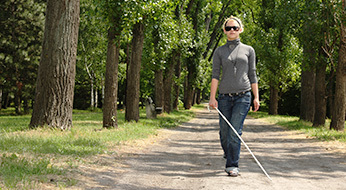 Accessible to everyone, they facilitate a spatial understanding of one's environment and enhance independence. 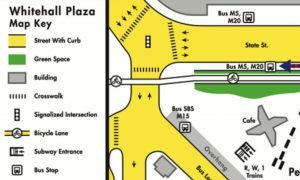 A unique and beneficial new wayfinding feature: High-contrast low vision maps for use with our text-based route narratives. 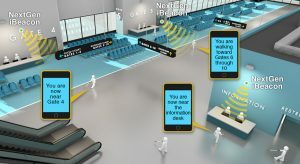 ClickAndGo Virtual Kiosks are a seamless complement to touchscreen kiosks, making the same venue and wayfinding information accessible to the visually and mobility impaired. * The following Click and Go products are protected by patents in the U.S. and elsewhere. This website page is provided to satisfy the virtual patent marking provisions of various jurisdictions including the virtual patent marking provisions of the America Invents Act. The following list of Click and Go products may not be all inclusive, and other Click and Go products not listed here may be protected by one or more patents. 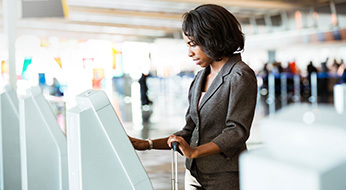 ClickAndGo Navigation, Virtual Kiosks and Wayfinding App are protected by U.S. Patents Nos. 8,886,462 and 8,594,935. Additional patents may be pending in the U.S. and elsewhere. "While attending the WBU Assembly in Bangkok, my stay was enhanced hugely thanks to the guidance provided by ClickAndGo. I even had an overview of the layout of the hotel before I left home, which is unheard of." "…As one who does a lot of traveling, I found ClickAndGo to be what I imagine it must be like for people who can see and read signs and get mapping. I imagine that sighted people must move around with the ease with which ClickAndGo allowed me to move around…"